The road to the lookout, variously indicated on maps as Forest Road 3040, Forest Road 3041, and East Twin River Road, is on the left behind the Snider Work Center approximately 0.50 miles/0.80 km down West Snider Road. Be sure to consult maps to ascertain the correct route. 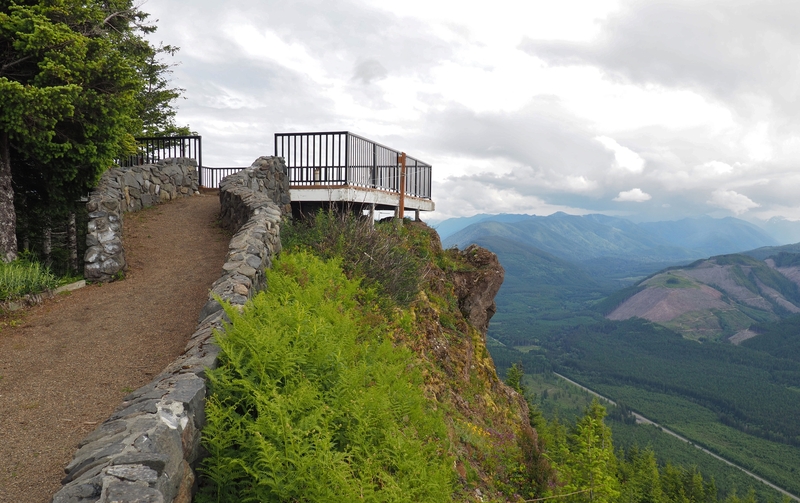 The Kloshe Nanitch lookout offers bird’s-eye views soaring the length of the Sol Duc River Valley and beyond. Kloshe Nanitch Trail, May 19, 2014. “Kloshe Nanitch” means “to stand guard” or “to keep a good look out” in the Chinook jargon, a pidgin amalgamation of French, English, and Pacific Northwest First Nations languages that was prevalent in the 19th and 20th centuries among local European and indigenous peoples (and not to be confused with the now extinct language of Oregon’s Chinook people). 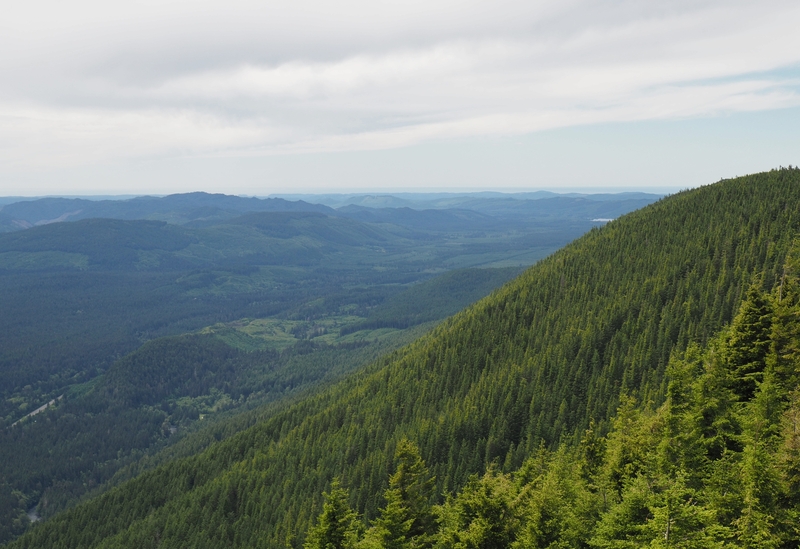 In keeping with its name, the trail’s destination is the remnant of a fire lookout perched atop Snider Ridge with impressive views of the Sol Duc River Valley below and the Olympic Mountains beyond. 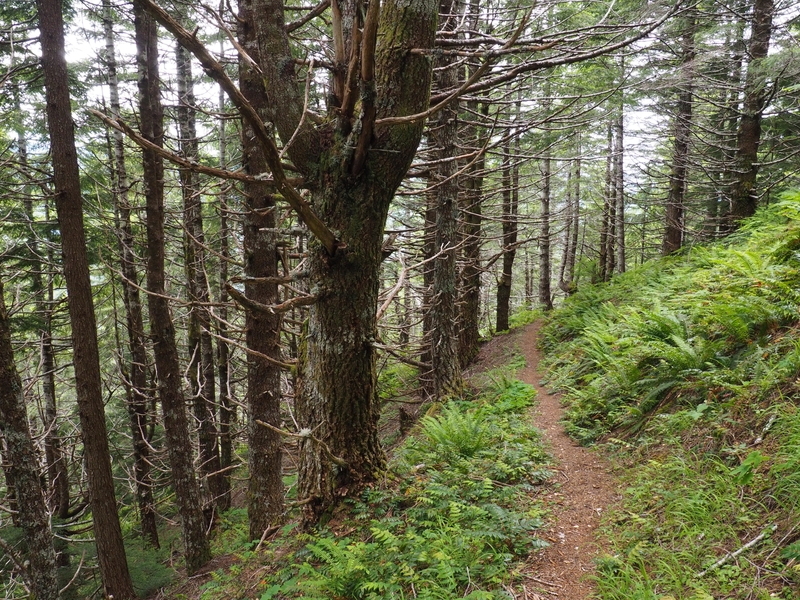 The trail climbs at first moderately and then steeply through airy coniferous forest delicately laced with vine maple, only breaking into open air in its final approach to the lookout. 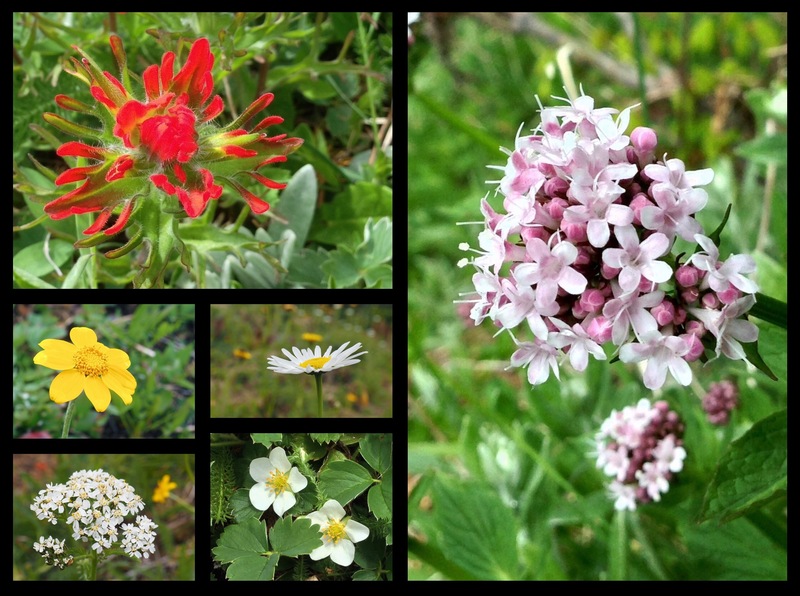 Spring and summer wildflowers dot the shady woodland, becoming much more prolific in the sunny clearings at the summit. 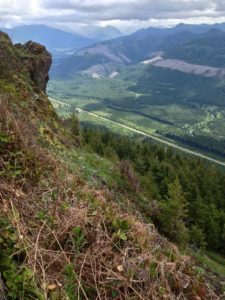 From Kloshe Nanitch, a short loop trail leads to the ridge’s North Point, with similar views, as well as the junction with the Snider Ridge Trail to Mount Muller, some three miles/4.80 km distant. Although it never quite loses the distant bustle of trucks trundling down nearby Highway 101, the little-used trail does offer a bit of solitude. Upon reaching the lookout, one may be surprised to learn that it can also be reached by a rough Forest Service road. Significant confusion exists as to whether a pass is required at the trailhead and, if so, which pass. Most resources state that a Northwest Forest Pass is required; however, a sign posted near the trailhead parking area states that a Discover Pass is required. Information provided by the U.S. Forest Service at the first of the “Additional Trail Info” links above states that, although the trail itself and the lookout are maintained by the U.S. Forest Service, the trailhead parking area is maintained by the Washington Department of Natural Resources and that therefore, a U.S. Forest Service pass is required to park at the lookout, but not at the trailhead. To be safe, hikers parking at the trailhead should display a state-required Discover Pass. For its first quarter mile/0.40 km, the trail follows an old road though moist, low-hung forest. Kloshe Nanitch Trail, May 19, 2014. 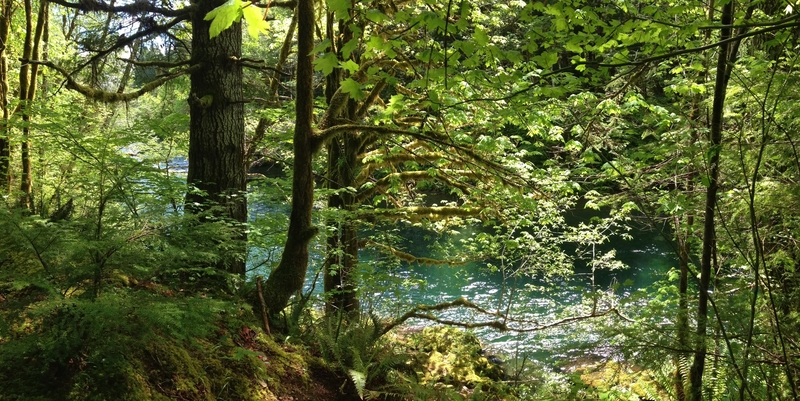 One of the Sol Duc River’s many serpentine curves meanders just beyond the forest fringe shortly before the road reduces to a trail that turns north up the mountainside. Kloshe Nanitch Trail, May 19, 2014. 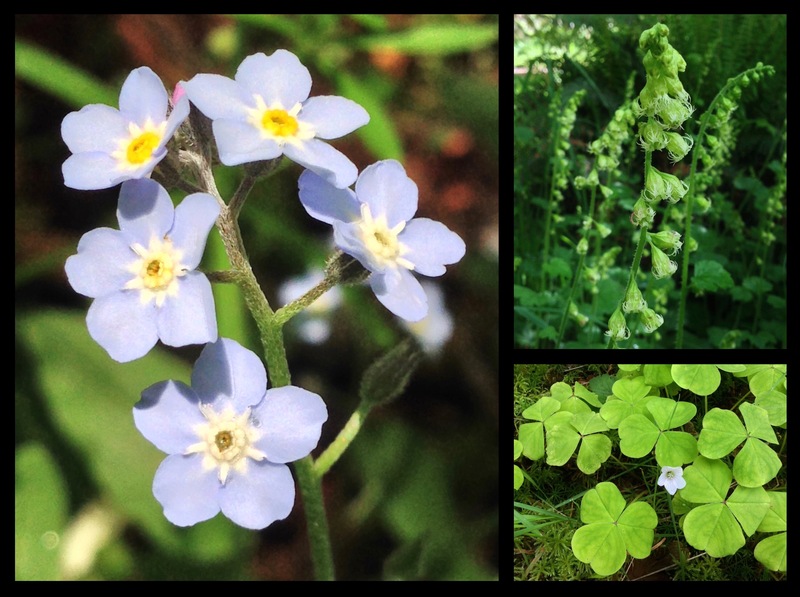 The riverine wayside hosts drifts of shade-loving wildflowers, including forget-me-nots (Myosotis scorpioides) (left), demurely nodding fringecups (Tellima grandiflora) (top right), and shamrock-like Oregon wood sorrels (Oxalis oregana) (lower right), which fold their pleated leaves downward like so many tiny umbrellas when struck by sunlight, quickly to reopen them when its scorching rays pass. Kloshe Nanitch Trail, May 19, 2014. Seemingly impenetrable forest fences the trail as it switchbacks upward. At lower elevations, vine maples (Acer circinatum) woven throughout the unbranched conifer columns create a delicate, lace-like woodland middlestory. In early summer, the maples’ twin-borne seeds ripen colorfully before drying and taking to the breeze as papery whirligigs. Kloshe Nanitch Trail, May 19, 2014 and June 17, 2016. 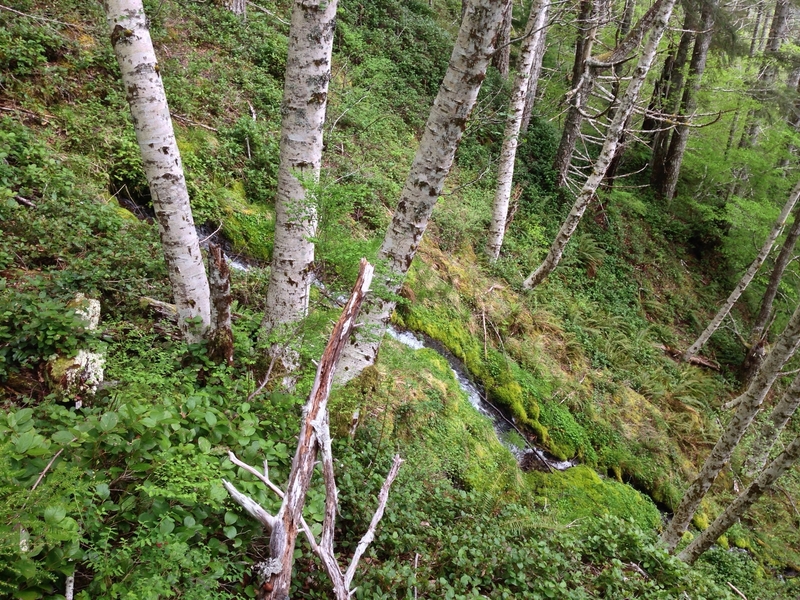 Several small streams cross the trail, but are easily traversed in one or two skips. Approximately halfway up the trail, look for one spring-born stream bursting directly from the mountainside just below the trail. Kloshe Nanitch Trail, May 19, 2014. In spring and early summer, diminutive wildflowers dot the shady woodland, including fuzzy pearls of salal (Gaultheria shallon) (top left); sprays of Cascade Oregon-grape (Berberis nervosa a.k.a. Mahonia nervosa) (center left); apple blossom-like pipsessewas, or, western prince’s-pines (Chimaphila umbellata) (center); characteristically paired American twinflowers (Linnaea borealis) (lower right); Pacific trilliums (Trillium ovatum) ranging from clear white to deep amethyst (lower center); and western spotted coralroot orchids (Corallorhiza maculata var. occidentalis) (right). Kloshe Nanitch Trail, May 19, 2014 and June 17, 2016. In contrast with their smooth, lower elevation neighbors, conifers along the ridgetop bristle with branch stubs like so many fishbones stood on end. Kloshe Nanitch Trail, June 17, 2016. 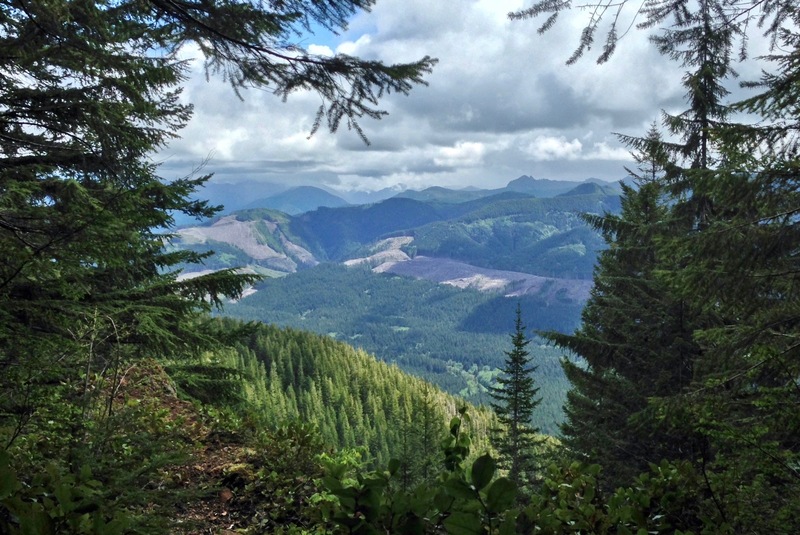 Near the summit, southward views begin to open toward the cloud-shrouded Olympics. Kloshe Nanitch Trail, May 19, 2014. 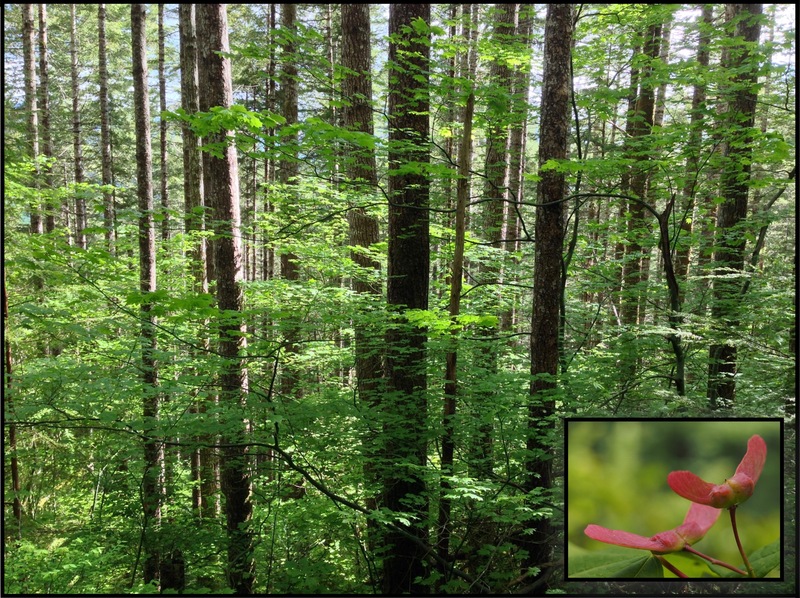 As skylights open in the forest near the summit, new blooms emerge into the increasing sunlight, including, western, or, Sitka columbines (Aquilegia formosa) (top left); wood roses (Rosa gymnocarpa) (center left); western bunchberries (Cornus unalaschkensis) (center); Cascade beardtongues (Penstemon serrulatus) (lower left); round-leaved, or, dark woods violets (Viola orbiculata) (lower center); and Columbia lilies (Lilium columbianum) (right). Kloshe Nanitch Trail, May 19, 2014 and June 17, 2016. Kloshe Nanitch’s lookout tops a jutting crag surrounded by a steeply pitched meadow. Kloshe Nanitch Trail, June 17, 2016. The mountainside meadow below the lookout is stippled with a variety of sun-loving spring and summer wildflowers, including harsh paintbrushes (Castilleja hispida) (top left); common woolly sunflowers (Eriophyllum lanatum) (left center); oxeye daisies (Leucanthemum vulgare) (center); common yarrow (Achillea millefolium) (lower left); blueleaf, Virginia, wild, or, common strawberries (Fragaria virginiana) (lower center); and Scouler’s valerians (Valeriana scouleri) (right). Kloshe Nanitch Trail, May 19, 2014 and June 17, 2016. 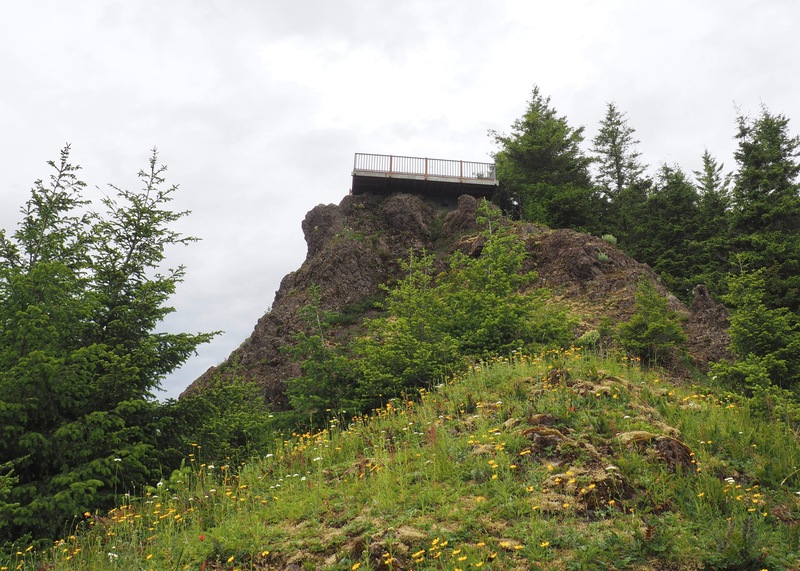 Kloshe Nanitch’s old fire lookout is gone, but its foundation now supports a sturdy viewing platform that commands a view of the Sol Duc River Valley below. Kloshe Nanitch Trail, June 17, 2016. 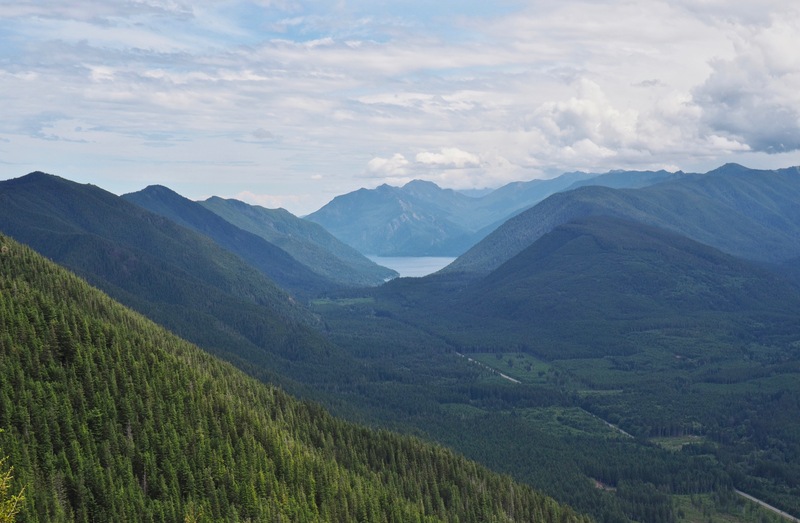 In the lookout’s eastern view, Lake Crescent lies cradled in its mountain fold. Mount Muller lies midway down the ridge on the left and can be reached by taking the Snider Ridge Trail from the North Point Loop that begins just below Kloshe Nanitch. Kloshe Nanitch Trail, June 17, 2016. The Olympic Mountains, often veiled in rain, rise beyond a succession of ridges to the southeast, the nearest of which, Bigler Mountain, bears the fresh wound of a recent clear-cut across its flanks. Kloshe Nanitch Trail, May 19, 2014. Below the lookout, the Sol Duc River Valley stretches away to the Pacific Ocean, which, on a clear day, lines the southwestern horizon. Kloshe Nanitch Trail, June 17, 2016. To the northeast of Kloshe Nanitch, Snider Ridge’s North Point is visible, crowned with a variety of antennae and other instruments. The North Point Loop branches just below Kloshe Nanitch’s viewing platform and circles 1.50 miles/2.40 km around the ridge to the North Point and then back to Kloshe Nanitch. Kloshe Nanitch Trail, June 17, 2016. For much of its distance, the North Point Loop snakes through dank barrens beneath the unthinned new forest that bristles from the ridgetop. 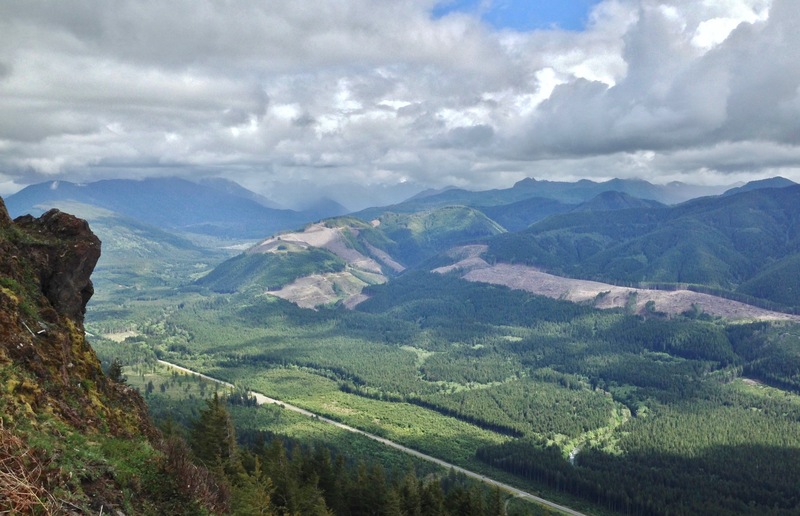 Between rocky escarpments, it affords partial views of the Sol Duc River Valley below, similar to the sweeping views from the Kloshe Nanitch lookout. 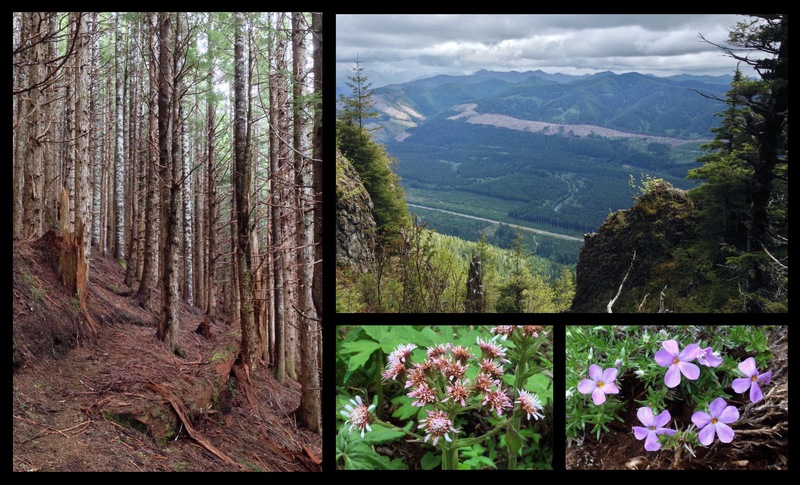 In addition to the other wildflowers already encountered, look for arctic sweet coltsfoot (Petasites frigidus) (lower center) and spreading phlox (Phlox diffusa) (lower right) where sunlight brightens forest clearings. North Point Loop, Kloshe Nanitch Trail, May 19, 2014. At approximately 1.20 miles/2.00 km from the main trail, the loop trail abruptly merges with a road just beyond sight of the North Point. Upon turning right up the road, the point’s various towers come quickly into view. Although limited, the view from the North Point is similar to that from Kloshe Nanitch, which is barley visible perched on the mountainside beyond (here, to the far right). To complete the loop, turn back down the road and continue past the loop trail’s junction with the road just 0.30 miles/0.50 km to Kloshe Nanitch. North Point Loop, Kloshe Nanitch Trail, June 17, 2016.